Australia destroyed by England as usual. Nice to see the convicts lose. And again. The end of the tour saves them for further humiliation. Well mr Buchanon, are you happy with the standard of your world cup warm up opposition now? My dear Z: I have been communicating with you for perhaps the last 3-4 years on this forum:kowt: however as serious a Pom supporter you may be..... can you really think that all is right with the cricketing world, when the hopeless and I repeat HOPELESS Poms win only three matche this summer in ANY form of the game and then take home a trophy......????? I think not. However, they are showing signs of improvement. I'd be happy if we only won a single game and won a trophy from it. Anyway, we won 5 matches, not 3, which is more than we won on our last tour of your great sporting, if slightly dangerous nation. Massive improvements there. I shouldn't worry too much, I predict one of these moments impending again. I think I will have 5 quid on the Poms as a dark ( ) horse for this world cup. Nothing will ever surprise me again. Are your wounded (Peitersen et al) going to be ready for the WC? 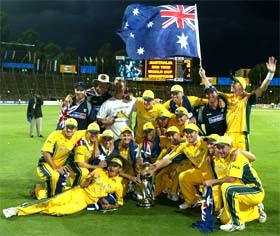 But back in the real world, India have won something! agnostic, you live in bangalore? I do. What was most impressive was 70-year-old Tata flying an F16. After all these injuries, 10 quid on Blighty does not seem like such a bad idea. After all it is time you won the World Cup, dont you think? Rubbish, methinks; Oz will win. Playing the odds you see! I'm backing your lads, as I back all underdogs. (I've been waiting for many years to say that ).